Two of my favourite words in the English language are free and food. Put them together and I’m in heaven. This year, we went to the 150th Royal Winter Agricultural Fair to watch Grace, who was selected by her 4H club show her goat Cloud. She did well, placing tenth out of 19 competitors. Watching the kids from her 4H club do well and seeing all the animals and agricultural exhibits was great, but the absolute best part of the Royal was the food and free samples. There are two mottos the Swinton family lives by. One is never turn down a free meal. The other is you can call me anything, just don’t call me late for dinner. Clare and I scoped out our plan of attack early in the day after grilling two regular Royal grazers at the coffee line-up. The morning run was a choice between homemade cinnamon buns or apple dumplings smothered with caramel sauce and ice cream. Mid-day, it was a toss up between the perogies, back bacon on a bun, poutine or rosti, scrumptious potato and onion pancakes with cheese and sour cream. Our afternoon repast consisted of fresh caramel corn, ice cream and fudge. And the free samplings, oh the samplings. Smoked sausage and pepperoni. 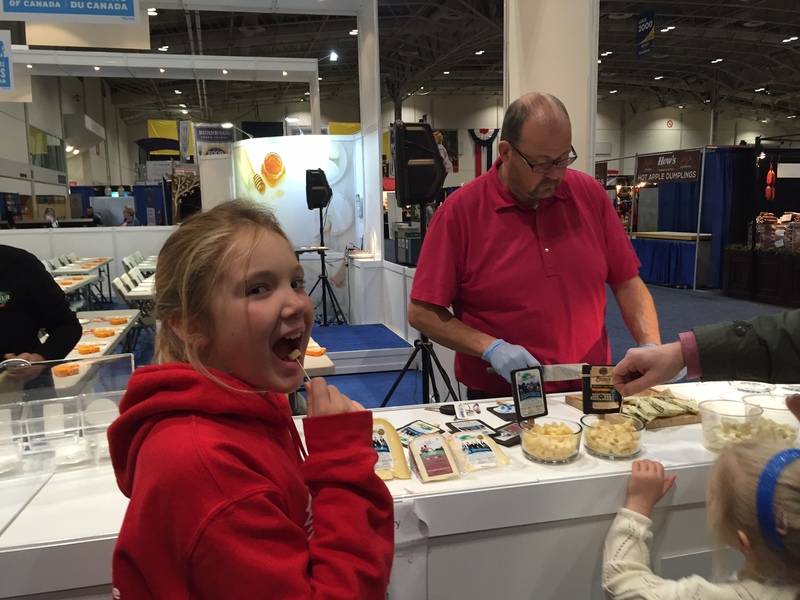 Cheese from the Ontario Cheese producers association. Granola and yogurt. Creamy chocolate fudge. It was a free food for all. This week’s #HappyAct is to see what free food you can score. The Gourmet Food and Wine Expo is on at the Metro Convention Centre this weekend. Some restaurants or eateries will offer freebies on your birthday. For instance, the Marble Slab Creamery offers a free ice cream to anyone on their birthday. Panera Bread, Cinnabon and Booster Juice will also give you a free pastry or juice on your birthday if you sign up for their rewards club. If all else fails, go to Costco! Is this the Royal Winter fair in Toronto? Yes, her first time at the Royal! The daughter and I have been there. Years ago now, but we remember those yummy apple dumplings.